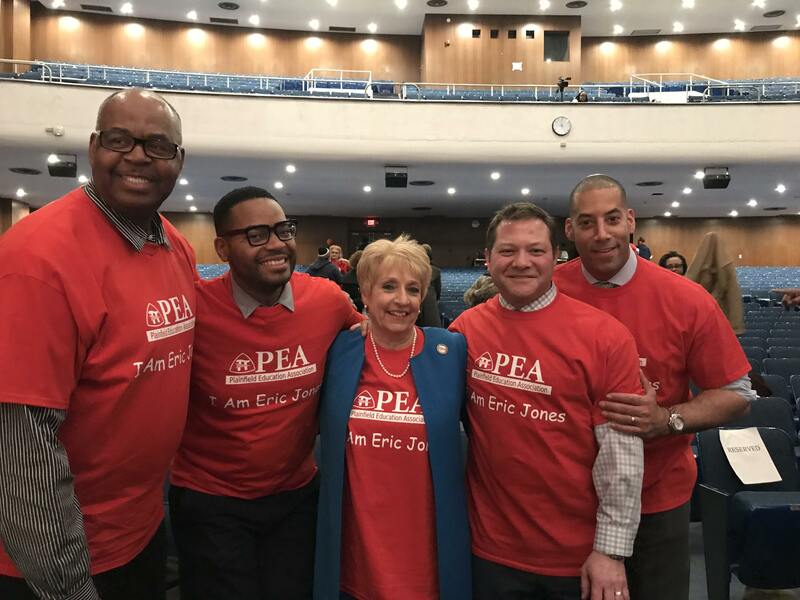 Last week, Eric Jones, president of the Plainfield Education Association, the union that represents the NJEA members in the Plainfield School District, received a Rice notice, his second notice in less than 60 days. A Rice notice informs an employee that the board of education intends to discuss that staff member’s employment status at an upcoming board of education meeting, and gives the employee the option of having the discussion take place behind closed doors or during a public session. In this case, Jones was told that the Plainfield Board of Education was voting to file tenure charges against him and he sought to have the discussion held in public, on Tuesday, January 15, 2019. The law governing tenure matters, NJSA 18A:6-11, states that a complaint would have to be brought forward for the board of education to consider such charges. As of last Tuesday night, neither Eric Jones nor the Plainfield Education Association had heard of any complaint. The Plainfield Education Association believed this attack was anti-student, anti-community, and anti-union and immediately sprung into organizing. Over the last several months, in particular with regards to the board elections, but ever since taking office as local president three years ago, Jones and his leadership team demanded transparency of the school board in their decision making, arguing that for a platform of “children first,” the board of education up to that point had only put themselves first. It was clear that for the first time in a long time, the board of education members felt a real threat to their personal agenda. Members of the Plainfield Education Association, as well as supporters of Eric Jones, the PEA, and the Plainfield educational community assembled before the meeting, carrying signs and wearing t-shirts chanting, “We are Eric Jones.” In addition, Jones’ supporters sent in letters admonishing the board of education for such harassing actions, and many lined up and spoke in support of Jones during the public session. Support came from as far away as Mullica Township, Camden and as near as Paterson and Jersey City. Following the speeches during public session, the board attorney shared his documentation with the board members to review in order to determine whether or not to file tenure charges against Jones. After a hush of quiet, a single confident voice on the board, Carmencita Pile, made a motion to drop the charges. Terence Johnson seconded the motion, bringing the audience to its feet. Five votes in favor of dropping the charges were needed to clear Eric Jones, and drop the matter. Pile, Johnson, Anderson and Andrews all voted in the affirmative, while Campbell and Morgan voted ‘no.’ Board President Richard Wyatt voted, ‘yes’ and a collective cheer erupted from the audience. Jones was cleared of the matter, and justice for the Plainfield students, community, the PEA and Eric Jones was served.